"Sixteen-year-old Rhine Ellery has only four years left to live when she is kidnapped by the Gatherers and forced into a polygamous marriage. Now she has one purpose: to escape, find her twin brother, and go home – before her time runs out forever. Thanks to modern science, every human being has become a ticking genetic time bomb – males only live to age twenty-five and females only live to age twenty. In this bleak landscape, young girls are kidnapped and forced into polygamous marriages to keep the population from dying out. But Rhine has more to contend with than losing her freedom. Linden’s eccentric father is bent on finding an antidote to the genetic virus that is getting closer to taking his son, even if it means collecting corpses in order to test his experiments. With the help of Gabriel, a servant she trusts, Rhine attempts to break free, in the limited time she has left." From reading about this online I was so eager to get a copy & then to my horror I found out that it's not released in the UK for what felt like forever at the time, so thank heavens for overseas shipping - I got my beautiful hardback copy shipped over from the US. I'm so pleased I didn't wait!! The cover is just stunning. 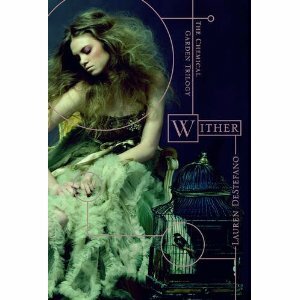 Everything from the model, to what she is wearing, to the little bird in the Cage is just Gorgeous! Its just perfect!! And I have SERIOUS envy for the dress - if anyone fancies making me a version of it, I'd be ever so grateful!! The story immediately captivated me. Straight away I got this feeling of dark mystery, maybe even slightly Gothic feel. It almost felt like I was reading a history book, but from some strange alternate reality where things have gone very strange. Having said that though, the date is never really mentioned. The only thing you are told is that buildings in the USA are VERY old and so it must be some years in the future. I'm very intrigued to see if more is mentioned about dates in the next two installments. This book deals with Polygamy - something I have never read about so really don't have a huge amount of idea on the ins and out, but I think this has been introduced in an ingenious way. Its a subject I don't see being talked about very often and I think its important that the YA market has all sorts of themes to learn about, even in a fictitious way. Obviously these guys marriages are somewhat different to what a normal polygamous marriage would be like in the fact that they don't all know when they are going to die, but still the idea is there and I applaud it! Reading about polygamy got me thinking about the idea though and I have decided it really wouldn't be for me. I would be jealous as hell of my sister wives, although the friendships that girls in this book do develop are quite wonderful. In this book world people die younger and so to live any kind of life they have to start young, much like things were years ago. I found it fascinating that things have kind of reversed in this world. Like our intelligence got so far that the only way to go was backwards. It really is quite amazing!! The book concludes with quite a hopeful end for our lead character Rhine. I was waiting for some big cliffhanger or some big shock which I didn't get. That's both great & kind of disappointing. But I do remind myself that there are two parts to come in the trilogy so there is plenty of time for me to get some heartbreaks which I am sure I will - EEEEEEK! This is just an amazing read, I can't recommend it highly enough - read it as soon as you can!! Oooooh pretty cover! Brilliant review, too. I must ask; Gabriel or Linden?? Ooooh that is so hard because I felt both were cool, but its gotta be Gabriel really. You?? Great review, I have to get this one but I'm going to wait til its out over here!